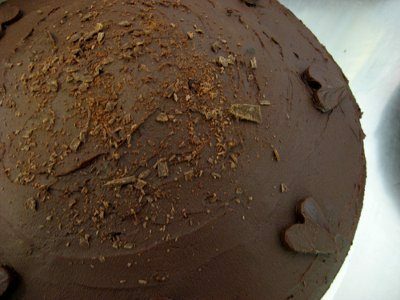 This makes a lovely moist cake which you can fill with vanilla icing and a chocolate top. Or why not try our variations for chocolate raspberry and chocolate blueberry at the end? 1. Sieve the sugar, cocoa, salt, flours and bicarbonate of soda into a bowl and mix well. 2. Add the oil, vanilla essence, vinegar and (cold) water. Combine well with a fork or spoon, but do not beat. 3. Pour into two greased round 7 or 8 inch cake tins with a loose base. Cook at 180°C/350°F/Gas Mark 4 for 30 minutes or until the cake springs back lightly when pressed. Cool thoroughly. 4. To make the filling mash the margarine and vanilla essence into the sugar with a fork. Refrigerate until use and when the cakes are cool use it to sandwich them together. 5. Make the topping by melting the chocolate in a double saucepan*. 6. Smooth the chocolate icing on the top, then decorate with flakes of chocolate (grate the chocolate and/or cut it really finely with a sharp knife). Variations – for chocolate blueberry or raspberry cake, put a layer of blueberry/raspberry jam in the middle of the cake along with the icing. *If you don’t have a double-saucepan, melt the chocolate in a heatproof bowl suspended over a saucepan of simmering water. Make sure that the bowl does not come into contact with the water.